Objective : To study VI Characteristics of Diac. Features : Instrument comprises of DC Regulated Power Supply 0-50 VDC/150mA, two round meters for voltage & current measurement, one Diac mounted behind the panel, connections of Supplies & Diac brought out at 4mm Sockets. Objective : To study VI characteristics & application of UJT as Relaxation oscillator. Objective : To plot static & Transfer Characteristics. Features : Instrument comprises of Two DC Regulated Power Supplies 0-15VDC/150mA & 0- 3VDC/150mA, three round meters for voltage & current measurement, FET BFW10 mounted behind the panel. We at international instruments industries are leading supplier and distributor in panel meter. AE is most popular name in panel meter industries. 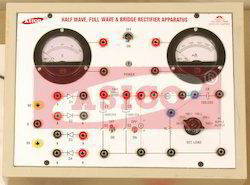 We are the suppliers of RISHABH / AE / MECO make Anaolg Panel Meters. •: Seven segment red & green colour LED display with 0.5" & 1 " size. •: AC current input is incorporated with builtin CT of 1Amp or 5Amp for isolation. •: Panel wiring is reduced. 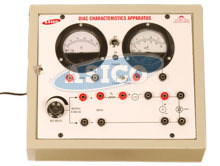 We at international instruments industries are leading supplier and distributor in panel meter.